You have certainly seen the headlines—as of August 22 the current bull market in US stocks became the longest on record. Yet worries abound, and at this writing, volatility has returned in force with a significant drop in global markets. 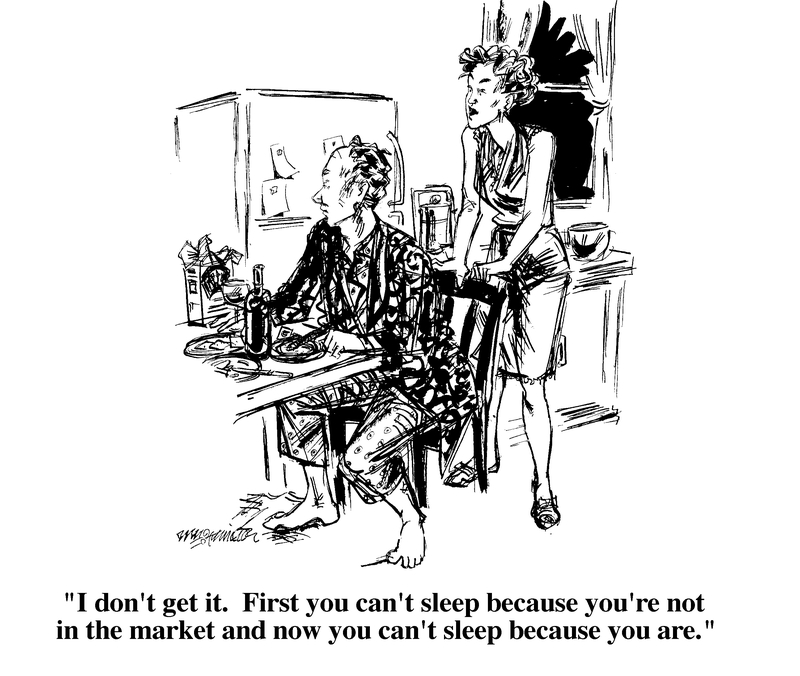 As the cartoon below jokingly suggests, endless speculation about what is coming next can keep even the most sanguine investor awake at night. Let’s take a brief look at some of the fundamental forces in play today. There are good reasons why US stocks are leading global markets. Since the Great Recession of 2008/2009, the US economy has persistently plodded its way to health. In fact, according to the National Bureau of Economic Research, the current economic expansion is on track to soon become the longest on record. While that fact is often paired with criticism that the pace of Gross Domestic Product (GDP) increase (about 2.2% per year) has also been the lowest on record for an expansion, there are undeniable benefits from the long period of growth. Today, unemployment is at levels last seen in the 1960’s, corporate earnings and profit margins are at record levels, and with persistently low inflation, wage growth is finally occurring. 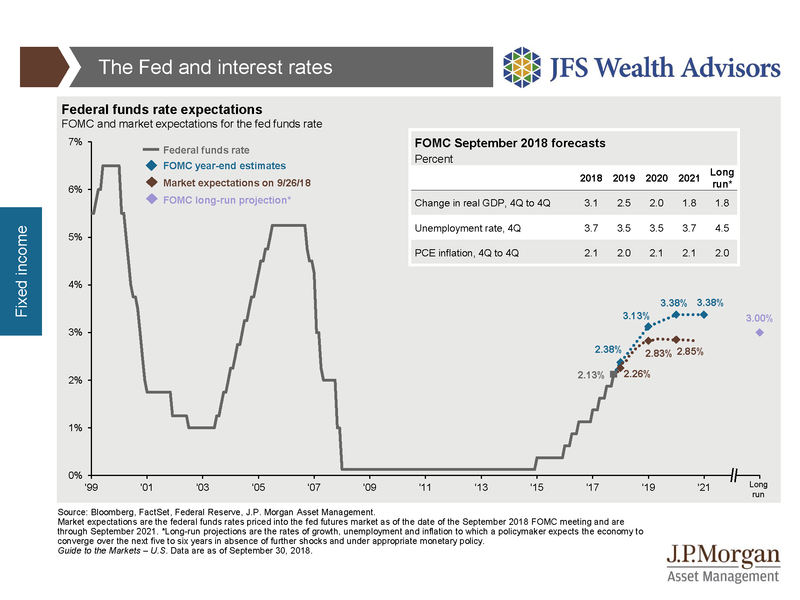 Yes, the Federal Reserve is raising rates, and yes, there is plenty of geopolitical drama around trade and fast-approaching US midterm elections, but the key economic drivers of financial markets—corporate profits and interest rates—have been generally favorable. While broad US indices are setting records, what is often overlooked is the fact this has been far from a painless and unbroken upward climb. In fact, there have been two periods since 2009 when stock prices corrected significantly. In 2011, from April through October, the S&P 500 fell nearly 20% in value. And in the 10 months from May 2015 to February 2016, the S&P fell almost 25%, small US stocks 26%, and emerging market stocks declined by 36%. So, the upward march of stock prices has not been a single monolithic market as the media likes to project—rather, it has been a more normal pattern of discrete periods of gains and drops. 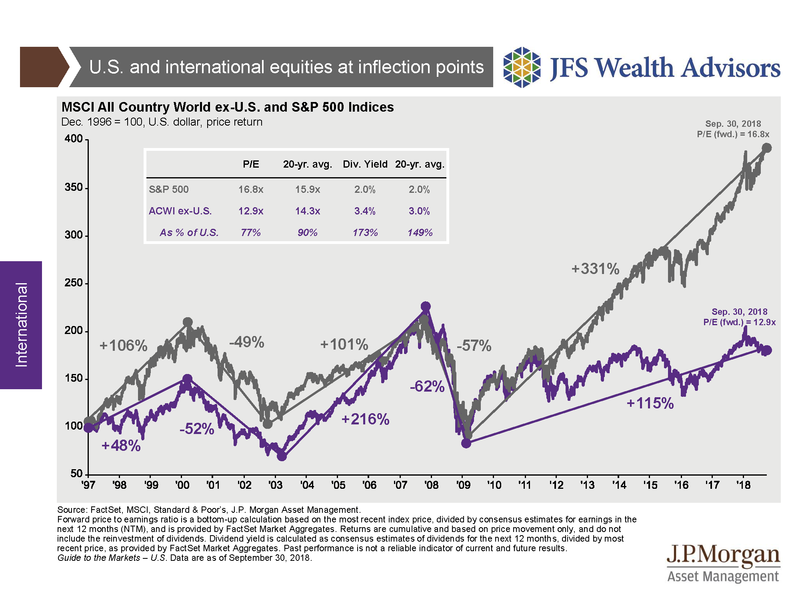 Some broad characteristics have marked the recent investing environment—growth stocks have beaten value stocks, a flood of assets has flowed into passive index stock strategies, and US stocks have, in general, significantly outperformed their foreign peers. These varied factors have created significant worldwide differences in market valuations, opportunities, and risks. Looking back to the prior market peak of October 2007, through August 31 of this year, growth characteristics have dominated value. Over that time period, Vanguard’s Growth Index has compounded at 9.92% per year and the Value Index at 6.74%—a difference of over 3%. For 2018 alone, the gap is significantly more impressive, with the same Growth Index gaining 14.98% and the Value Index only 5.57%—a gap of over 9%. Looking abroad we see a similar picture, as the MSCI EAFE Growth ETF is up 0.55% while the corresponding Value ETF has declined 5.29%. What’s been happening? Low interest rates were fuel for stocks in general, as the cost of borrowing was far below the profits that could be made. But of particular note was that in the early part of the economic cycle, traditional value stock dividends, in many cases, exceeded the returns that bonds could give. That math has now changed. With the rise in Federal Funds that began in 2015 (see below) to the current target level of 2.00% – 2.25%, the appeal of income-oriented stock strategies was diminished. Also, the strength of technology/consumer discretionary companies (think Amazon) in today’s gig economy has dwarfed more traditional value companies (think energy or food staples). And the torrent of money flowing into index-based strategies has created a self-fulfilling price rise in the largest stocks in those indices, as more funds buy ever more of the same stocks. At this writing the 10-year US Treasury note has a yield of 3.2%, 90-day US Treasury bills 2.2%, and the S&P 500 1.8%. This means, from a pure yield perspective, the typically less volatile bond asset class is now attracting money that previously might have sought income-yielding stocks. Not surprisingly, the sizzling performance of large company growth stocks has led also to a valuation gap—currently, the forward price-to-earnings ratio (P/E) for US large growth companies is over 20 versus 13.8 for large value. While there are valid reasons these gaps have been created, care must be taken to not just look in the rear-view mirror. For those of you who remember your high school statistics class, the historical behavior of mean reversion in financial markets strongly suggests that value should, at least on a relative basis, offer compelling opportunity. While the US has led the world out of the Great Recession, it is vital to remember that the economy of 2018 is truly global. It might surprise you to learn that US stocks comprise only slightly more than 50% of the world’s markets. Thus, nearly one-half of the world’s stocks are domiciled outside the US, representing significant opportunity that should not be overlooked. These stocks, in general, offer lower valuations, with the ACWI ex-US index trading at a forward P/E of approximately 13 versus approximately 16 for the S&P 500. Lower starting valuations can suggest higher future returns since there is more room for price and earnings expansion, and many of the fund managers to whom we speak are finding fertile ground for investment in this area. 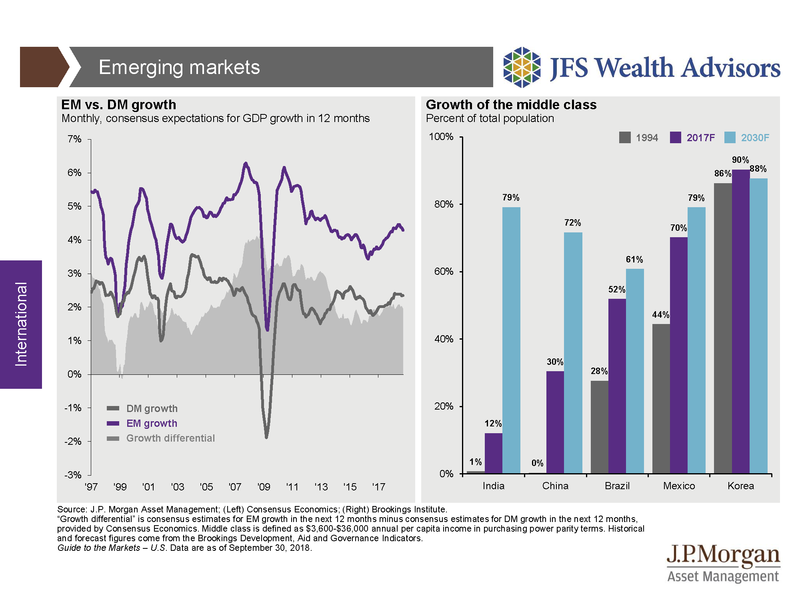 In addition, consider this: Emerging Market (EM) stocks comprise approximately 12% of the world, yet approximately 40% of global GDP is from these emerging economies, so their punch is much larger than their weight. Future growth in these economies is significant as the middle class population expands dramatically. Estimated EM economic growth is thus nearly double that of developed economies. World stock markets—particularly the United States—have climbed a long way since the dark days of 2008 and early 2009, and have done so for solid reasons. Yet, counter-intuitively, the positive news is creating predictions of gloom. Ignoring the “noise” and focusing on the long-term perspective is crucial. The US economy is indeed likely in a “late-cycle” position, but that does not mean domestic and global stocks are no longer attractive. Opportunities abound across the world in spite of cross-currents. The value style and companies outside of the US offer intriguing valuations. Diversification is key. Interest rates are rising, making bonds more competitive with stocks. This benefits the tried-and-true balanced portfolio. Alternative investments, such as commercial real estate, can offer solid diversification and differing sources of portfolio returns. Volatility is likely to rise, and yes, the economic cycle will turn and the US will enter a recession at some point. But working in conjunction with your advisor to determine the most appropriate balance of risk versus reward, the goal is not to try and time when markets will move. Rather, the goal is to seek the benefit from the long-term history of growth in common stocks, driven by demographic and economic trends, and use diversification across asset classes to temper the volatility. JFS portfolios remain, in general, well-diversified, and balanced between stocks and bonds as appropriate to each client situation. A consistent value orientation is in place, and while overweight to US stocks based on world indices, we are also committed to seeking opportunities across the globe in developed and emerging international markets. We value your continued confidence and trust. Please contact your advisory team with any questions.